I was born and raised on the shores of the Atlantic ocean, my childhood was filled with lakes, ponds, swamps and woods. When I was 15 years old I got my first job on a fishing boat as a bait boy. It was here that I spent my impressive years fishing for Bluefish with a bucket of chum latched to the rail. I fished for Striped Bass with a burlap bag full of clams that had been "tenderized" with a baseball bat to create the scent trail that these 50# monsters would follow to our clam baited hooks. This was the beginning. After four years in the Navy I got my first job in the laboratories of Revlon the cosmetic giant. The next job was as Operations Manager for Chanel #5 perfume laboratories It was during this period of my life that I learned about pheromones, musk, animal scent glands and all the good stuff I couldn't learn in any college. Years of perfume and cosmetic formulas later, my wife and I arrived in sunny Arizona in 1980. I had surf rods, striper rods, fluke rods and weakfish rods but hardly a bass rod in the closet. It was the early 1980's when I first got a good look at some of these great lakes and great fishermen that sailed them. After what seem like forever I finally got to the point that I was comfortable going out for an afternoon and catching a few Bass. It was during this period that I started to try different scents and ingredients to enhance my catch. As a chemist I firmly believed that the world revolved around scent aroma and things we don't know about or understand. Just watch your dog take a walk and you will see what I mean. Expense meant nothing to me because I had samples of the finest ingredients that money could buy all for free. I set up a lab and began trying out different things on my numerous fishing trips. Some things worked, some didn't. The things that worked I kept in my own private formula and the things that didn't work I stopped using. There was no rush to do this and the entire process kept me busy for 10 years easily. I finally had a formula that was beating all my fishing partners by wide margins. Some trips would be just a two or three to one margin, sometimes it was 35 to 7. Not all my fishing partners believed in my little bottle, even after getting the whipping of their life. This taught me that you can lead a horse to water, but.....Well that's life, everyone has beliefs and everyone has disbelief's. In 1997 at a B.A.S.S.® mega-bucks tournament in Texas I met a world class pro who sponsored a certain fish attractant. I asked him to give Kick'n Bass® a try, His response...."I don't believe in fish scents." Yet he received thousands of dollars a year to promote another scent. I was sitting at my desk in a cosmetic company in Arizona when a man by the name of Greg VanSteenkiste (Stinky for short) came to sell me some ink jet equipment for date coding my bottles. He noticed a picture of a Bass on my desk and asked me if I would like to go to Mexico for Christmas and fish with him. I didn't know this guy's last name and he wants to take me on a free trip to Lake Ovachic. Thank you Lord ! We arrived a half day early and proceeded to fish from the bank in front of the club house where we were staying. Here we are in sunny Mexico on one of the top lakes in the world and for the last 3 hours we didn't catch a fish. By now we had put away the spinnerbaits and crankbaits and were trying to coax even a dink to take our worm offering. It was at this time that I opened my tackle box and pulled out some of my fish attractant. I proceeded to catch a Bass. Greg grew up on the Pacific ocean and had fished for everything from Tuna to Salmon, so it didn't take more then one fish before he said " Hey squirt some on my worm." We then proceeded to catch and release tons of Bass. 2-3-4 pound fish all the way to dark, my scent had saved the day. The last morning of our trip was great, until we ran out of salsa. About 9 AM we started to go fishless once again. Greg couldn't get over it, no salsa = no fish, it was that simple. After about an hour of fishing his expensive scented worms and no fish, things were looking rather gloomy. Up to now we had just been using the cheapest, oldest worms in our tackle box, the ones that never caught anything. But even Greg's expensive worms still produced nothing. He turned to me and said "last day, last call...we better do something." Then it came to me. Knowing how long my scent sticks to a bait I started to smell all the worms in my tackle box one by one. When I came to some with a residual odor of scent I handed it to him. You guessed it, he immediately started to catch fish again. Greg just couldn't believe it, the guide couldn't believe it. I believed it, I knew my formula. When Stinky came back down to earth he turned to me and said "Do you know what you have here?" I told him I knew, but that was it. It was my own personal formula and I didn't want everyone in the world using it. He said "why don't you market this stuff, people deserve to have it ?" I told him I went to school for science, not marketing. He said he went to school for marketing, not science. And with that , while sitting on a lake in Mexico we shook hands and became partners in Scientific Bass Products. The "salsa" the gringo's used became known as Kick'n Bass® and it hasn't stopped Kick'n Bass® since. If fish can't smell then why do they have nostrils? 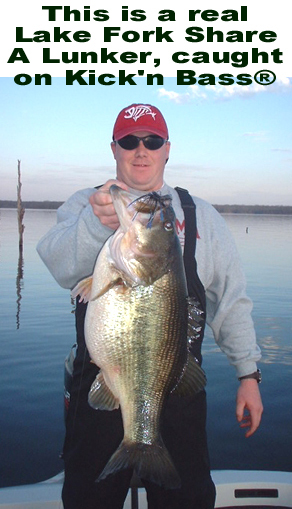 This article may be reprinted as long as links are sent back to Kick'n Bass® at www.kicknbass.com and credit given to Kick'n Bass® Products, Inc. Send mail to kicknbass@earthlink.com with questions or comments about this web site.